Derbyshire County Council has spent more than any other UK authority on award events, according to new figures. A Freedom of Information Request revealed it spent £218,483 over three years, with 13 other councils spending more than £100,000. The UK total for the three-year period was £6.5m, according to the report from TaxPayers' Alliance (TPA). DCC said this kind of spending had halved but much was down to long service for its "dedicated" workforce. According to the TPA's report, the average spend was £18,064 per council. DCC's spending also totalled £14,658 more than all Welsh councils combined. The figures also showed 65 councils spent nothing in the financial years 2015-16, 2016-17 and 2017-18. DCC said the figures related to staff long service awards, with the council now spending "less than half what has been reported". 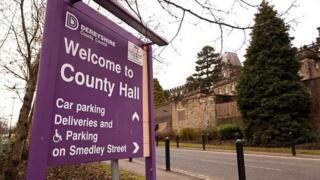 It added: "Derbyshire is one of the biggest council employers in the country with around 12,000 staff. The second highest amount was £162,189 spent by Armagh, Banbridge and Craigavon Borough Council in Northern Ireland, followed by Manchester City Council's £155,500. The report showed councils in Northern Ireland spent over three times more than the UK average, while Welsh councils spent 44% less. Scottish spending was almost 40% higher than the English average. A spokesman for the Local Government Association said: "Awards ceremonies range from the promotion and support of local businesses, recognising the valuable work of volunteers or bringing communities together to celebrate what is positive about where they live. "The value of these events is worth far more to communities and local economies than their cost." The TPA said it sent FOI requests to 419 councils in England, Northern Ireland, Scotland and Wales, with 53 failing or refusing to respond, or providing an "inadequate" response.